Billed beforehand as very much a showdown between Norwegian tyro and rising star of world athletics, Jakob Ingerbrigtsen - who had completed a stunning 1500m and 3000m double on the track at the 2018 European Championships - and the collective strength of a host of fine African talent from the traditionally strong nations of Kenya, Ethiopia and Uganda, the race was started by Danish royalty in the form of Crown Prince Fredrick and included four circuits of the 2k course. While in the early stages the race very much went to form, as the event went on the gruelling course saw the Norwegian drop off the leading pack after half way and he had finally to settle for 12th place, the race itself won by Milkesa Mengesha of Ethiopia in a time of 23 minutes 52 seconds from his compatriot Tadese Worku in second and Ugandan Oscar Chelimo in third. Leonard meanwhile, who had struggled with a cold in the week beforehand, ran a very consistent and sensible race, finding no doubt that the local circuit of Rothbury hills over which he trains stood him in good stead and showing that he was in no way out of place in the very tough company. 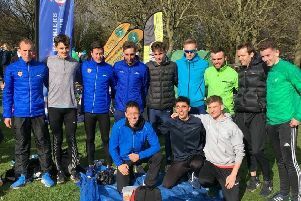 He finally finished in 37th place in a time of 26m 33s and was second GB counter for the team, who while finishing in 8th place had the satisfaction of being first European outfit. In an exhausting race over five laps and just over 10,000m (that saw some slower runners from the 41 countries competing lapped), MacLennan, twice a winner of Northern Cross Country titles, applied herself with huge determination over the five laps and more than justified her selection, coming home like Leonard as second GB counter in 32nd place and only 10 seconds behind Shildon’s Kate Avery in a time of 39m 5s. At the front of the race, a titanic tussle between Kenya’s Helen Obiri and Ethiopian’s Dera Dida and Letesenbet Gidey saw Obiri finally triumph in 36 14s. While the team prizes for the event went to Ethiopia, Kenya and Uganda, GB’s women, for whom Jennifer Nesbitt and Jess Piasecki were third and fourth counters, did carry off a tremendous team performance by finishing in fourth place. Four young sprint talents from Morpeth Harriers were in action at the annual Northumberland Minor Schools Indoor Athletics Championships, held at Gateshead College on Wednesday 27th March. Hannah Lott (St Benet Biscop CA), and Kaitlyn Waddell (Dukes Secondary Campus) both qualified for the Final of the Year 7 Girls 60m Hurdles, by winning their respective heats in 10.8s and 10.5s. In the later run Final, Lott won in an improved 10.3s, with Waddell a close second, producing an identical time to that of her heat. Both athletes also competed in the Year 7 Girls High Jump, where Waddell placed second with her best clearance of 1.30m, and Lott finished fourth with 1.25m. Lott and Waddell also competed in the 60m Sprint events, where Lott qualified for a B Final (8.98s), and the latter finished second in her heat in 9.26s, subsequently missing out on a Final place. Another Morpeth Harrier to make it to the B Final was Freya Caygill (Chantry Middle School), who won her heat in 9.03s. For Caygill it was indeed encouraging, as this was her very first Indoor experience, and for Lott, her 8.98s was a new lifetime best. The fourth Morpeth Harrier of the quartet was Year 7 Boy Sam Dent (Chantry Middle School), who won his heat of the 60m Sprint in 8.74s, and in the later run final, Sam finished fifth in 9.1s.